In February, a month after the news broke that Disneyland was the epicenter of a measles outbreak that would result in 35 cases in Orange County and 121 more across California and seven other states, a South County mother got some upsetting news. She and her 4-year-old son, whom she has decided not to give the MMR vaccine that protects against measles, had been banned from two local playgroups. “They posted something online, saying that if you’re not up to date on your vaccinations, please don’t come to our next meet-up,” says Nicole, who’s in her mid-30s and asked that only her first name be used to avoid additional shunning of her family. It was a daunting rebuff. No more bayside walks? No more communal visits to the Playland Cafe, a trendy Irvine hangout where young moms sip exotic teas while their offspring cavort on equipment designed to develop kinesthetic skills? But it wasn’t enough to make Nicole return to the pediatrician who, as she tells it, had dismissed her concern about whether vaccines carried the risk of causing her son to develop autism, which she’d read about on the Internet. To Nicole, vaccines sound too dangerous, no matter what the U.S. Centers for Disease Control and Prevention, the American Academy of Pediatrics, and myriad medical journal articles say. Medical experts say Nicole and others like her are endangering their own kids and jeopardizing the health of vulnerable members of the community—infants, cancer patients, and the sick and frail who can’t be immunized—and possibly causing future epidemics by threatening the herd immunity necessary to prevent diseases from spreading. But Nicole is undeterred and passionate about the cause. She formed her own playgroup, which welcomed other like-minded moms and their unvaccinated offspring. And as the kids play together, the moms talk. 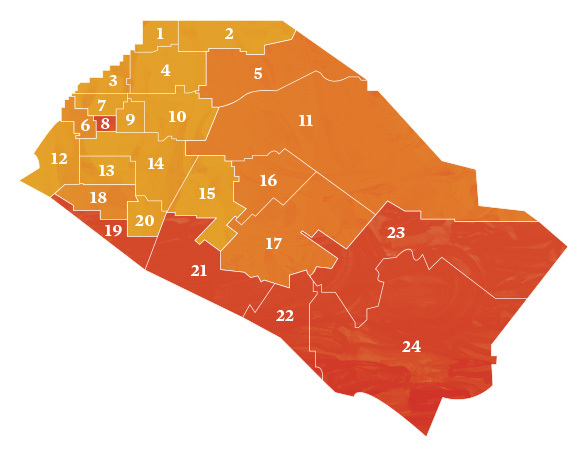 Orange County might seem an unlikely hotbed for the anti-vaccine movement. The stereotype of vaccine skeptics is that they’re affluent, presumably left-leaning New Age dilettantes, the sort you might run into at a health-food emporium interrogating a hapless clerk about the chlorophyll content of the house-brand wheatgrass. While some Hollywood A-Listers might fit that description, a recent YouGov poll showed that political conservatives are more likely to embrace the idea of a link between childhood vaccines and autism. While the majority of Orange County children are getting their shots, compliance with the CDC’s recommended schedule of injections is slipping. In 2013, the most recent year for which data was available, just 73.6 percent of the county’s 2-year-olds were up to date on their vaccinations, according to a report released by the Orange County Children’s Partnership. That’s down from 81 percent in 2009. Among older kids, the numbers are better. But there are pockets of low compliance, most in upscale South County. In the Capistrano Unified School District, 8.6 percent of unvaccinated students are attending classes thanks to waivers that parents can obtain—more than three times the state average. In some private schools, the vaccine waiver rates are even higher. As The Orange County Register reported in September, at Journey School in Aliso Viejo, 60 percent of the kindergarten class for 2013-14 had skipped at least some vaccinations. What the numbers don’t convey is the complex nature of vaccination resistance in Orange County, which combines a preference for alternative medicine and organic diet with a libertarian belief in personal freedom and a mistrust of government, with a touch of religion thrown in. Actually, people used to die of the virus or its side effects. According to CDC statistics, in 1963, before the nationwide vaccination program started, about 3 million to 4 million Americans got the measles each year, of which 400 to 500 died, and 4,000 contracted encephalitis, a brain inflammation caused by the virus. Still, some parents see choice about vaccinations as a question of empowerment. Former nurse Dotty Hagmier of Dana Point now runs Moms in Charge, a nationwide support network of moms who strive for a mindful, organic family lifestyle. “We focus on the things within our control as moms to raise healthy, vibrant kids,” she says. A latecomer to vaccine skepticism, Hagmier vaccinated her oldest daughter and son, but says she had an epiphany when nurses at her pediatrician’s office gave her youngest daughter an extra dose of the Hepatitis B vaccine because of a records mix-up. “I was speechless,” she recalls. She decided to take control by declining more shots, and trying to protect her kids from illness with diet and lifestyle changes. “I decided for my family that I’d had enough,” she says. “I felt that with what I was doing for their immune systems, if they got mumps, it was not a death sentence.” As she read about cases of children injured by adverse reactions to vaccines—events that doctors and public health officials point out are statistically rare—her conviction became stronger. Skepticism about vaccines, she says, “is a civil rights issue” about parents’ ability to choose what’s best for their children. Pellman thinks vaccines are victims of their own success, because most parents today are too young to have experienced the suffering and fear that outbreaks once caused. Instead, those parents focus on the rare adverse reactions, and on the discredited notion that vaccines play a role in autism. Those arguments fail to calm the vaccination resisters. They aren’t dissuaded by a massive 2011 meta-analysis of more than 1,000 scientific studies by the national Institute of Medicine, which found serious side effects from vaccines are rare, and that there’s no link between vaccines and autism. This was underscored in a study published in JAMA in April. That information comes from what the resisters feel is a government-funded pharmaceutical industrial complex that many anti-vaxxers see as corrupt and engaged in a massive coverup. They’ve got their own sources, most notably Andrew Wakefield, the lead author of a 1998 Lancet article that claimed to show a connection between MMR vaccinations and autism. The Lancet retracted the article in 2010, after Great Britain’s General Medical Council found Wakefield had committed dishonesty and ethical violations in his research. The GMC also determined “Wakefield’s name should be erased from the medical register,” which bans him from practicing in Great Britain. Nevertheless, Wakefield, who spoke at the California Jam health and wellness festival at Costa Mesa’s Segerstrom Center for the Arts in March, has supporters who believe his work was unfairly suppressed. “They never showed his data is not true. They just went after him for other reasons,” says Mark Filidei, a Newport Beach-based physician who uses alternative therapies in his practice and grew more skeptical about vaccines after one of his sons suffered an adverse reaction to one. Many also gravitate toward Dana Point pediatrician Bob Sears. He’s the author of “The Vaccine Book—Making the Right Decision for your Child,” a strong seller since its 2007 release. He also writes and edits for the popular pediatric advice website, askdrsears.com. Sears’ alternative schedule doesn’t sit well with many pediatricians, who think it leaves children vulnerable to diseases for longer periods, creates more stress, and increases the chances that they won’t complete the list of vaccinations. “It increases susceptibility, increases needle phobia and stress with no benefit, and plays into the false notion that children can’t handle these vaccinations,” says Paul Offit, director of the Vaccine Education Center at the Children’s Hospital of Philadelphia. Despite mainstream medical objections, some parents are opting for an alternative schedule. A 2014 study in The Journal of Pediatrics found that in parts of New York state, about one in four children follow alternative schedules. A 2013 Institute of Medicine report noted that while there’s evidence that the conventional CDC schedule works in reducing illnesses, deaths, and hospital stays, more research should be done on the number, frequency, timing, and order of the shots, and the age at which they’re given. All of this has escalated the groundfire in Orange County’s homegrown vaccine wars. Sears has shifted from being an information provider to a defender of vaccine resisters’ rights. On his Facebook page and in a recent op-ed piece for the Register, he argued against legislation introduced by state Sen. Richard Pan, a Sacramento Democrat and pediatrician, and Redondo Beach Democratic Sen. Ben Allen. Their bill, SB277, would eliminate the belief exemption and prohibit public and private schools, daycare centers, and other institutions from admitting unvaccinated children unless they have medical justification. “We shouldn’t wait for any more children to sicken or die before we act,” Pan said at a February news conference. Other states are considering tightening their rules as well, and Pan’s position has wide national support even though he became the target of personal attacks because of his position. A recent Reuters poll found that 65 percent of Americans think schools should be able to refuse admission to unvaccinated students. Many anti-vaxxers see the bill as the first step toward a sort of pediatric totalitarianism in which the government might someday track down kids and inject them with serum. They’re joined in that fight by Robert F. Kennedy Jr., who, while in Sacramento to oppose the bill in April, linked the rise in autism rates to unsafe vaccinations, later calling autism an epidemic much like a “holocaust,” a word choice for which he later apologized. Sears tells Orange Coast he has stepped up his rhetoric because of the bill. Sears says he’s also taking a more strident line about the potential downside of vaccines, such as the nearly $3 billon that a federal compensation program has paid out since the late 1980s to victims who became seriously ill after vaccinations. In context, the incidence of such harm represents a miniscule portion of the number of vaccinations; for the MMR vaccine, for example, 87 patients were compensated for injuries between 2006 and 2013, out of more than 73 million who got the shots, or 0.0001 percent. Such rhetoric hovers like smoke above the Orange County battleground, alongside the March report’s conclusion that the Disneyland measles outbreak happened because vaccination rates are too low. Measles is extremely contagious and can spread through the air. The immunity threshold needed to protect a community is high; at least 92 percent of the population needs to be vaccinated to prevent its spread. Other diseases are less contagious; the threshold for polio, for example, is estimated at 80 to 86 percent. In the meantime, battle lines continue to form between the pro-vaccination majority and dissenters such as Nicole. She recently had her second child and has been investigating another option for protecting against measles—homeopathy, an alternative healing method that involves putting drops or tablets under the tongue. “They take the mucus of someone with measles, and break it down into minute amounts, and put it into the pellets,” she says. The National Institutes of Health website warns there’s little evidence that homeopathy works, and that it shouldn’t replace vaccinations.